What a night it was! Unbelievable scenes of jubilation engulfed the nation as India were crowned World Champions defeating Sri Lanka by 6 wickets in the final of the ICC Cricket World Cup. Egged on by a boisterous 33,000 spectators that included a galaxy of Bollywood stars, politicians, business tycoons, industrialists, sportsmen and other celebrities not to forget the common man and also billions watching on television, Mahendra Singh Dhoni and his men in blue scripted a new chapter in the annals of India’s cricketing history. In a match that lived to up a tournament final, both teams engaged themselves in a witty contest between bat and ball. Chasing 275 to win the final, India were rocked by Lasith Malinga as Virender Sehwag first and then Sachin Tendulkar were back in the pavilion by the 7th over. However, the impressive Gautam Gambhir and the no-nonsense Virat Kohli buckled down and raised a partnership that made the people believe that we could do it. When Kohli fell to a brilliant moment of inspiration from Tillakaratne Dilshan, the script was not complete. Mahendra Singh Dhoni promoted himself up the order ahead of the in-form Yuvraj Singh and played perhaps the most significant innings of his life. Dhoni shed the diffidence that had characterized his innings in the matches so far in this tournament and batted like a man possessed. He seemed to have saved his best for the last. Gambhir and Dhoni played with such composure that slowly all began to believe that India would finally end a wait of 28 long years. Gambhir was cruising towards his hundred when he made an unnecessary charge at Thisara Perera and lost his stumps. As Dhoni was to say later, only Gambhir himself had to blame for he was at the doorstep of a historic century in a World Cup final – a feat only six men had done before. This was a minor glitch as Yuvraj Singh and Dhoni helped India coast to a fabulous victory in the 49th over. The winning shot will forever be etched in my mind. Dhoni’s eyes lit up as he saw the ball sailing over the long on boundary and the swing of his bat on the follow through was as delightful as that murderous six. Earlier, there was drama at the toss as Kumar Sangakkara’s call was not heard clearly in the din of the crowd and he won the re-toss and decided to bat first. Zaheer Khan imposed on the batsmen with the new ball and with an unusually sharp Indian fielding, the Sri Lankans found the going tough. Tharanga scratched around for 20 deliveries but could only score 2 before finally edging to slip off a Zaheer Khan delivery that moved just a shade. Dilshan tried to sweep Harbhajan Singh but the ball kissed his glove and dislodged the stumps to leave Sri Lanka in trouble. However, their stalwarts – Sangakkara and Mahela Jayawardene – put the innings back in its groove before Sangakkara found a thick inside edge trying to cut Yuvraj Singh and Dhoni took a good catch. Jayawardene was ably supported by Thilan Samaraweera as Sri Lanka started to realize that 250 would be a good score on the pitch. Samaraweera and Chamara Kapugedera departed in quick succession as Sri Lanka appeared to be wilting under pressure. Nuwan Kulasekara displayed some cool manners as he helped Jayawardene negotiate the tricky period in the lead up to the batting Powerplay which was taken by default in the 45th over. The Indian bowling and fielding deteriorated under pressure as Sri Lanka plundered 63 runs in the final five overs to take them to a healthy 274/6 in 50 overs. Jayawardene reached his century during the process – a masterclass that was to be in vain as proved by the subsequent events of the night. The Sri Lankan total appeared a strong one at the innings break as the pitch had been showing signs of slowing down. But the Indian batsmen had other ideas and on the night nothing could stop them. The win set off celebrations like India had never seen before in its history. People were out on the streets waving the tricolor, honking horns and cheering their heroes. The cricketers themselves shed tears of joy, understandably so, as this was something every one of them wanted to achieve so badly. Sachin Tendulkar was beaming with pride and was carried on his shoulders by Virat Kohli and Suresh Raina. Tendulkar went on to say that this was the proudest moment in his life. Indeed it was, for his story would not be complete without such a glittering feather in his cap. The team did it for Tendulkar, who as Kohli rightly said, had carried the burden of the nation on his shoulders for the past two decades. It was indeed time for them to carry him on their shoulders! Sri Lanka will be disappointed to finish second best for the second time running. It was perplexing why they made such wholesale changes to their side and upset that winning combination. The batting was understandably strengthened but the bowling lacked bite which undid them in their search for wickets. The only change they had to make was to bring in Thisara Perera for the injured Angelo Mathews, which they did. The decision to bring in Kapugedera for Chamara Silva was also a right one. But the decision that backfired was the one to leave out both Ajantha Mendis and Rangana Herath. The result was that only Malinga looked threatening and the others just did not come to the party. India’s cup of joy brimmed over on the night thanks to the performance of their batsmen – Gambhir and Dhoni in particular. Gambhir kept his focus throughout and lost it only when he threw his wicket away. Dhoni was the good old Dhoni we all wanted to see – aggressive and spirited. The batsmen made up for the poor showing of the bowlers and fielders in the final overs. The next step for India is to be dominating as the Australians once did, but for that, these Indian cricketers need to put their heads down and their feet firmly on the ground. I will start with an interesting stat. India and Sri Lanka have met each other 21 times in one-day internationals since 1st January 2009, with India winning 12 of those and Sri Lanka 9. This would perhaps be the most prolific instance of a bilateral encounter. Their paths have been star-crossed and they meet again, with a valuable prize at stake – the title of World Champions. Come tomorrow, the attention of the whole cricketing world will be glued to Mumbai’s Wankhede Stadium. Sri Lanka looks in good shape ahead of the final. Their tournament has been very consistent. Barring a loss to Pakistan and a rain ruined contest against Australia, they have won every match of this tournament. Their strength lies in bowling and top order batting. The quarter final and semi final showcased Sri Lanka’s bowling prowess with the spinners reaping most of the rewards. In Lasith Malinga, they have a match-winning bowler. Malinga was not at his very best in the semi final and would be a bigger threat in the final. His slinging deliveries are hard to read particularly the ones that take the pitch out of the equation. He can be wayward as well and the Indians will be praying for Saturday to be a bad day for him. It remains to be seen whether Sri Lanka stick with their three spinners strategy that worked well against England and New Zealand. There are fitness concerns for Muthiah Muralitharan and Angelo Mathews. I think Sri Lanka should play Thisara Perera in the final for two reasons – he has a good record against India and he can be trusted to take wickets better than Mathews. The batting looks settled though I still feel that Chamara Kapugedera is a far better option than the defensive Chamara Silva. Sri Lanka will again look to their opening batsmen to give them a rousing start and Sangakkara and Jayawardene to consolidate. They need to develop a new strategy for their lower middle order. Thilan Samaraweera should go further down the order as he would be better off carrying the tail and pushing the score along. Following Sangakkara and Jayawardene, Silva or Kapugedera should come in with Perera/Mathews sandwiched between either of them and Samaraweera. India will have to shore up their batting big time. Batting remains India’s strong point but poor performances in the batting Powerplay during the league stage and inability to convert starts during the knockout stage have been the case this tournament. Mahendra Singh Dhoni would do well to outthink Kumar Sangakkara. But with a settled batting position, there is hardly any room to make an innovative adjustment. Dhoni needs to shed his diffidence and go after the bowling like he has done in the past. Like Sri Lanka, India too look towards it openers to get a great start. The bowling has improved but there is still a lot of work to be done. Inability to take early wickets – and by early wickets I mean wickets in the first or second over – has been a problem. On an average, in the tournament, India has succeeded in taking the first wicket in the 9th over and the average first wicket partnership against them is 43. This should be food for thought for the seamers. If Dilshan and Tharanga are allowed to stay at the crease, then the match is as good as lost. Harbhajan Singh should derive a lot of confidence from his showing against Pakistan. India will think twice before deciding whether to play two seamers or three. The pitch at the Wankhede stadium is expected to aid batting during the first half of the match and then assist the spinners later on. When Sri Lanka and New Zealand played earlier at the ground in their Group A encounter, Sri Lanka made 265 and won by a comfortable 112 runs. It is not clear whether the same pitch will be used for tomorrow’s final but it gives an indication of what to expect. The captain who wins the toss would decide to bat first and avoid the pressure of chasing in a big match. The final is a day/night encounter and it is debatable whether the final of a tournament as big as this should be a day/night one. Either of the teams is at the mercy of the dew at night, which means it does not give a level playing field for both the teams. This should be some food for thought for the ICC. All said, the final should be exciting. Two illustrious players from both sides will hope for the pinnacle of their careers. Sachin Tendulkar will be playing the World Cup final at his home ground bidding to win his first one whereas Muthiah Muralitharan will be playing his last match before retirement aiming to add one more World Cup to the one he won in 1996. Sadly, one of them has to lose but cricket will be the winner on the night of April 2, 2011 at the Wankhede Stadium in Mumbai. I shall conclude with an interesting stat as well. Clive Lloyd was the tallest captain to win the World Cup at 190 centimeters while Allan Border was the shortest at 173 centimeters. For the record, Dhoni is 173 centimeters tall while his Sri Lankan counterpart Sangakkara is 179 centimeters tall. Plotting the heights of the World Cup winning captains on a trend line will give you the probable height of the captain who will win the World Cup this time. It is 180 centimeters with a 64% probability. 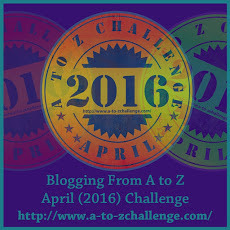 I'm Blogging from A to Z in April 2016!